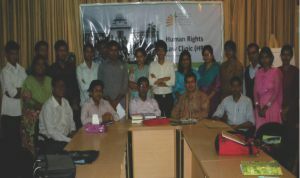 The Human Rights Law Clinic (HRLC) at UNESCO Madanjeet Singh South Asian Institute of Advanced Legal and Human Rights Studies (UMSAILS) organised a lecture session on “Judicial Activism: A Tool for the Protection of Human Rights” on 10th November 2012 at its conference Room at Dhanmondi, Dhaka. Dr. Ridwanul Hoque, Associate Professor of the Department of Law, University of Dhaka was the keynote speaker at that lecture session. Among others, Mr. Anisur Rahman, Assistant Professor and Head of the Department of Law, Eastern University and Mr. Shankor Paul, Head of Human Rights at Concern Universal, Bangladesh spoke at the session. Dr. Uttam Kumar Das, Human Rights Lawyer, moderated it. The speakers and discussants observed that there is a requirement for a pro-active role of judges and relevant legal professionals for the strategic utilization of judicial activism for ensuring the people's access to justice. There is a lack of understanding and scholarship in Bangladesh on the concept and application of judicial activism said Dr. Ridwanul Hoque while giving his lecture. He claimed that the Judges cannot act arbitrarily rather they should act judicially. When the judges approach the law going beyond the two persons or two parties of the case or suit effectively, then it is called 'Judicial Activism'. Judicial Activism can be the best tool for the protection of human rights but the State is the main culprit for the violation of human rights. Existing poor mechanism of the protection of Human Rights in Bangladesh and breaking down of the 'Rule of Law' are great problems for a sound judicial activism. Disappearance, cross-fire are regularly being traditionalised and girls are being victimized in the safe custody which are the gross violation of human rights. Sometimes someone is detained unlawfully and at last the court says that 'you are free now' which cannot be a good practice of judicial activism. However, Judges are in better place to be an activist of human rights. He went on to say that, now the Public Interest Litigation (PIL) is well established in Bangladesh. It should not be confined only in the fundamental rights -- part three of the Constitution of the People's Republic of Bangladesh. The scope of judicial activism should be practiced in each organ of human rights.